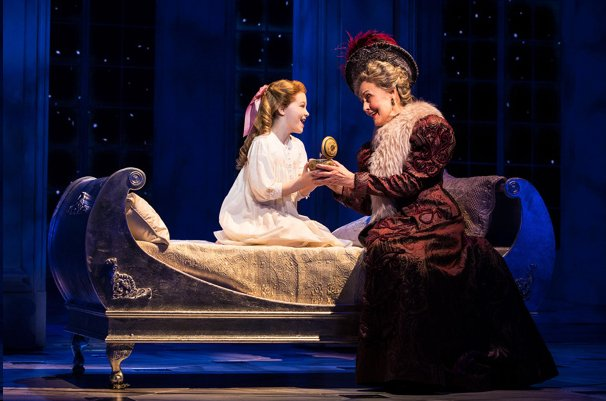 What Anastasia has, and it’s welcome because it’s lacking to some degree in virtually every other new musical of the past several seasons, is craft. Scan the credits: book by Terrence McNally, music by Stephen Flaherty, lyrics by Lynn Ahrens—the trio responsible for Ragtime some 20 years ago, for some of us the last genuinely great musical. If you’re tired, as many of us musical purists are, of rhymes that half-rhyme or don’t even try, lyrical lines that don’t match in feet, genres that bump up inappropriately against one another, directorial conceits that loudly announce: Look at me, I’m more important than the text—this is the show for you. It’s also one of the most extravagantly beautiful physical productions you’ll ever see. A masterpiece? Far from it. But Anastasia might be called breathtakingly competent. It has a complicated family tree. First came Marcelle Maurette’s drama of Anna, the woman who professed to be the grand duchess who somehow survived the Russian Revolution, a modest 1954 hit, starring Viveca Lindfors as Anna and Joseph Anthony as Bounine, the Russian opportunist trying to pass her off as grand duchess to the one survivor of the Royal Family, the Dowager Empress, in 1926 Berlin. Then came a 1956 film version, with Ingrid Bergman being welcomed back to Hollywood after a marital scandal, and collecting an Oscar. Anya, a 1965 operetta version employing Rachmaninoff themes, was the last show to play the Ziegfeld Theater—alas, not for long. Twentieth-Century Fox, which owned the film rights, dusted Anastasia off again in 1997, this time as an animated musical with an Ahrens-Flaherty score, in a moderately successful bid to steal some thunder from the musical cartoon renaissance then being enjoyed at Disney. This version added some fanciful elements, including keeping Rasputin alive well past the revolution (they needed a villain), and endowing him with a talking-bat sidekick named Bartok. Nonetheless, it was a hit, and the Oscar-nominated “Journey to the Past” was soon on the lips of millions of teenage girls. Judging from the whoops and hollers at the Broadhurst, a number of them have grown up and can afford theater tickets, and some have brought their daughters. Every version plays fast and loose with the facts, suggesting, first of all, that the confused young woman sweeping St. Petersburg streets, with a mysterious past and minimal long-term memory, may in fact be the grand duchess—a notion long disproven by DNA. 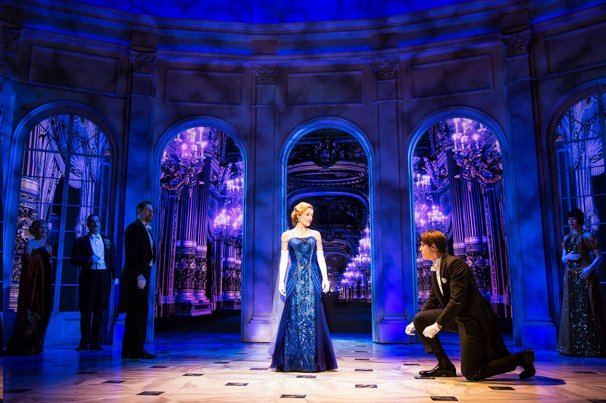 Take it as the fiction it is, though, and it’s a better story—especially as Anya (Christy Altomare) finds herself attracted to Dmitry (Derek Klena), the shifty operator who’s tutoring her for an introduction to the Dowager Empress (Mary Beth Peil), aided by Vlad (John Bolton), who had a long-ago romance with Countess Lily (Caroline O’Connor), the empress’s lady in waiting. 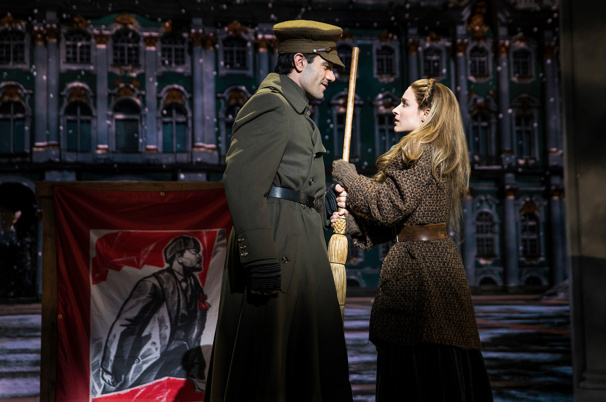 Thus the standard two-couple-musical-comedy format is established, and we’re more preoccupied with the question of will-they-or-won’t-they-end-up-together than ugly Russian Revolution facts. This in spite of Gleb (Ramin Karimloo, in splendid voice), the dashing Russian spy charged with thwarting Anya, up to and including brandishing a pistol at her we know he’ll never fire. 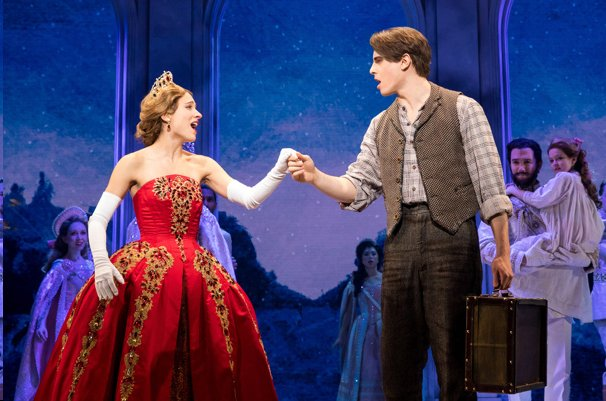 John Bolton, Christy Altomare, Derek Klena and the cast of Anastasia. As we travel from St. Petersburg to the Russian countryside to the Hungarian border to Paris (the Dowager Empress was actually in Denmark in 1927, but hey, Paris is prettier), the eye is dazzled. 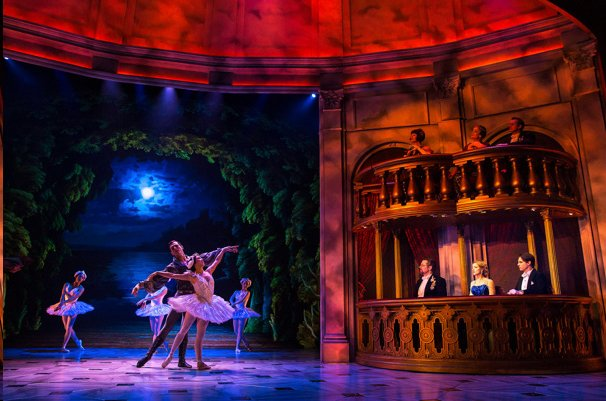 Wow, the producers spent some bucks on sets (Alexander Dodge), costumes (Linda Cho), and lights (Donald Holder), with a pastel palette that conveys how rich this new world must look to Anya and Dmitry. While Groundhog Day struggles with malfunctioning turntables up the street, here’s an intricate set that really works, plus the most eye-filling wardrobe this side of War Paint. Highlights: the jewels of the Romanovs, revisited throughout in flashback, and Altomare’s knockout red gown for her climactic encounter with the Dowager Empress. (McNally’s writing here, drawing some on the witty, epigrammatic screenplay Arthur Laurents wrote for Bergman, is at its best.) Dodge’s sets transition on a dime, and Aaron Rhyne’s excellent projections add to the feast. A dash through Paris visually recalls the “Bonjour, Paris!” sequence in the 1950’s movie musical Funny Face, and we even get a healthy dose of Swan Lake, beautifully danced by Allison Walsh and Kyle Brown, as the empress, Anya, Dmitry, and Lily size one another up at the ballet. Altomare and Klena don’t overflow with chemistry as go through their Henry Higgins-Eliza Doolittle paces, but they’re attractive performers with good voices, and she has a nice stillness in repose, suggesting an Anya who’s always processing, quietly. Bolton and O’Connor serve up loads of second-couple expertise and share a nearly show-stopping duet, “The Countess and the Common Man,” while Peil, lovely as always, invests the Dowager Empress with a mournful dignity. A large chorus quickly changes costumes to serve as white Russians, Parisians, soldiers, ghosts, what have you, and director Darko Tresnjak is notably good at knowing where to place them. If the storytelling falls short of inspired, it’s consummately professional, and never dull. Anastasia is structured like Rodgers and Hammerstein or Lerner and Loewe, with the big moments arriving where they’re expected, the appropriate situations dramatized in song, the literacy level high, and the resolutions somewhat predictable but eminently soul-satisfying. Hamiltonians may find it too neat, too traditional, a journey to the past beyond the inclusion of "Journey to the Past.” But lovers of well-structured, romantic musicals, and audiences hungry for a visual pampering, are likely to have a wonderful time.